I have been reading more and more on the health benefits of oat bran, and after finally finding it at a local health food store here in Umbria I decided I needed to begin adding it to our diet. Bran is actually the outer layer or husk of grains such as oat, rice and wheat, and for many years, this outer layer was simply discarded during the milling process until people learned of its health benefits. Diets high in oat bran have consistently shown great health benefits such as lower cholesterol, healthier hearts and improved intestinal health, and in fact the very popular Dukan diet strongly proposes we add oat bran to our diets to help promote weight loss. I have in the past used oat bran in hot cereals along with other grains, but I wanted to make a breakfast muffin, that would be healthy yet delicious. 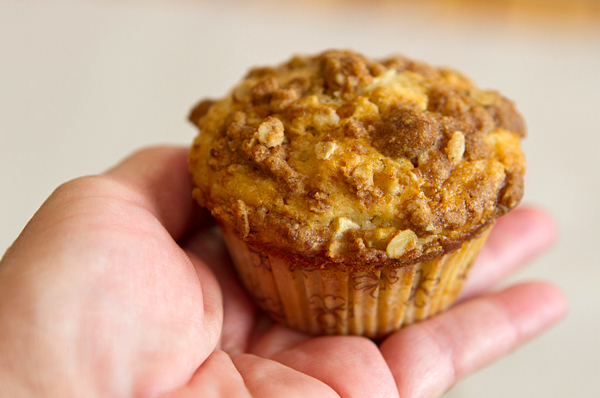 I love apples in muffins so added apples along with some chopped walnuts and topped my muffins with a cinnamon, sugar topping that added a nice crispy finish to the muffins. Diets high in oat bran, rice bran and wheat bran have consistently demonstrated great health benefits such as lower cholesterol, healthier hearts and improved intestinal health. Nuts are rich source of protein, omega-3 fatty acids, and dietary fiber. 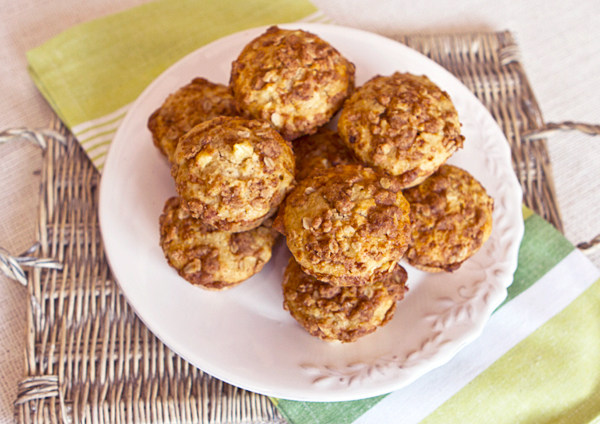 A healthy, moist muffin that is great for breakfast or as a quick snack throughout the day. Preheat oven to 375 degrees F. and line a 12 cup muffin tin with papers. Whisk together the flour, oat bran, sugar, baking powder and soda, salt, and cinnamon in one bowl. In another bowl whisk together the buttermilk, honey, butter, eggs, apples, and nuts. Pour the wet ingredients into the bowl with the dry ingredients and stir just until blended. If using the topping, combine all the ingredients in a bowl and rub together with your fingers. Sprinkle each muffin with some of the topping ingredients, then bake for about 20 minutes or just until firm to the touch. Turn muffins out onto a wire rack to cool.